Paul McGowan led all Florida State defenders in tackles for 3 straight seasons from 1984-1987. In his Senior season he was a First Team All-American as he made 150 tackles including 13 for losses, and won the Butkus Award as the nation’s preeminent linebacker, however he waited until the 9th round to hear his name called by the Minnesota Vikings. A final cut in the preseason, McGowan joined the Browns but was also cut as well. At 6’0″, 222, many teams felt he was undersized and slow for the position, but the numbers said otherwise. 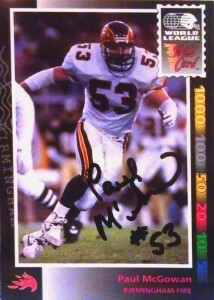 Paul was signed by the Ottawa Roughriders of the CFL in 1989 and made 42 tackles, and ended up being cut early in 1990. He was drafted by the Birmingham Fire in the first round of the WLAF’s linebacker draft in 1991, and was a force to be reckoned with in the team’s 3-4 alignment. The team’s tenacious defense led the Fire into the playoffs, and McGowan was charged with leading the linebacker corps with 59 solo tackles and 3 fumble recoveries. Head coach Chan Gailey called McGowan a ‘glue guy’; Basically, a player who makes sure that every player is lined up right and ready. Equally impressive linebacker teammate John Brantley, however won the WLAF Defensive MVP award. McGowan returned in 1992, and so did the Fire to the playoffs, losing again to Barcelona in the first round. 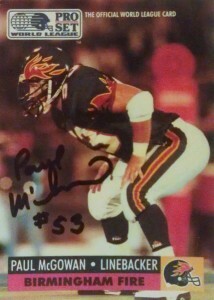 Paul expressed interest in returning to the Fire for the 1993 season, however the WLAF reorganized shortly there after. 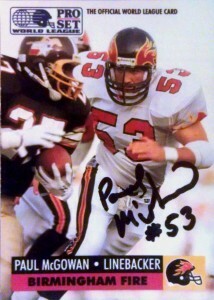 Paul joined the Orlando Predators of the AFL in 1993. As an ironman league at the time McGowan got to play both sides of the ball in the league’s traditional LB-FB switch off. He’d play for the team through 1997 when he decided to go into firefighting instead. In 1998 Paul was inducted into the Predators Ring of Honor and at the time of his abrupt retirement was the team’s career leader in sacks. In 2010, McGowan was ranked in a poll as the 11th greatest Florida State player of all time. I followed the internet rabbit in order to find this one and struck gold. Paul signed these cards and also included a nice note with them, thanking me for the reminder of the great memories.